Israeli author, Smadar Shir reading her children's book in which mother's and grandmother's are portrayed as working, independent women. Periods of upheaval foster creativity, and make for rich literature on subjects like war, domestic violence, discrimination or social injustice. However, how to write about these issues for children in a meaningful way? That is what Israeli author Smadar Shir tries to do in her books for children: tackle heavy topics like war by writing about it through the eyes of a dog, giving it a refreshing angle, adding a little humour, and making it relatable at the same time. In writing about violence for children, Shir falls back on her own family’s experience. Much of her life has been spent amidst conflict and violence in a volatile region. Her 15-year-old daughter has already witnessed three wars, spending numerous nights in bomb shelters. However, even in those bleak times Shir says her family continued to have faith and remained hopeful for better times. Shir was in Kathmandu last week with another prominent Israeli writer, Dorit Silverman, as part of a tour of South Asian countries where they interacted with students as well as writers of children’s literature. In Kathmandu, they visited several schools accompanied by the new Israeli Ambassador to Nepal, Benny Omer. Nepal-Israel literary relation goes back to 1965, when the then President of Israel had translated some poems of King Mahendra into Hebrew. Writers are currently working on publishing Nepali translations of some anthologies of Hebrew poems. Silverman is the Vice president of the Hebrew Writers Association and has published 19 books, teaches literature at Israeli universities and is also a lawyer. In 2017 she won the Prime Minister’s Award for Literature. 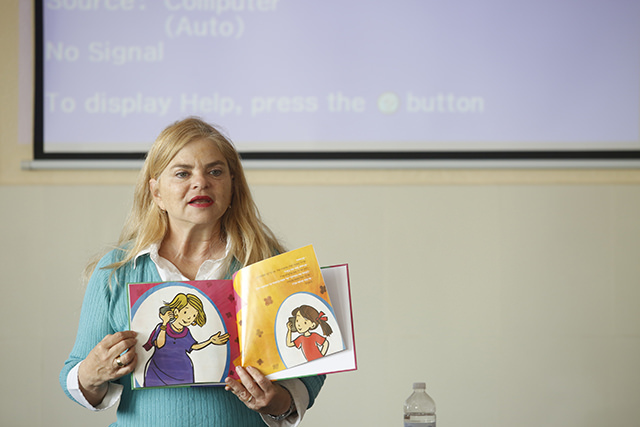 Smadar Shir is a popular author of children’s books, senior journalist and songwriter and has written over 400 books for children and adults which have been translated into many languages. Her award-winning book The Tenth is currently being translated into Mandarin. Although both their children have been to Nepal to trek, it was the first time in Nepal for both authors. They had imagined Nepal only as a mountaineering destination, but said they were fascinated by the culture and heritage of Kathmandu Valley.